It sure is similar. On Massdrop no less. That link only takes me to their main catalog page. No clue where the knife is. That link takes me right to the page. Try Communities - Blades. I'm not suggesting anything more than a coincidental similarity. Is it single-bevel? Sure, but it also appears to have a thicker center along its length, and is forged. That is what got my attention. Appears very utilitarian, but not much on looks. The Japanese make some good steel blades, but I've never been comfortable with their styles of knives and axes. Thanks for posting the photo marchone. I am not a member of "mass drop" so I could not see the price. What is it likely to be? Well I got on and see it is $75.00. Rockwell is 62. I watched the little video of the guy working some fruit and vegetables over and see now that the sheath is wooden and the handle matches that. I had one of those a long time ago but a much smaller version. Anyway it is a decent looking blade and is reminiscent of a Kephart in the spear point shape. It is sort of utilitarian looking and might be of use to someone who doesn't mind what their knife looks like. I sort of like the blade from what I can see of it but the handle looks like a dowel someone drilled a hole in for the tang and shoved on there. I am presuming it is a stick tang and may not be peened or bolted on the pommel end. my guess is that the scabbard is half or more the cost of this knife. I keep going back and forth on the value higher lower. Is it 25 or 40. Less that 50 imho. It is also probably not forged in the straight forward sense we would take it to mean. By the way, a Makiri is known today as a fisherman's knife. Wildly different than its western counterparts. Many sites I found promote its use as a bushcraft, camping, and all around utility blade. This site describes its use by Ainu people as a woman's knife. And there is this one. 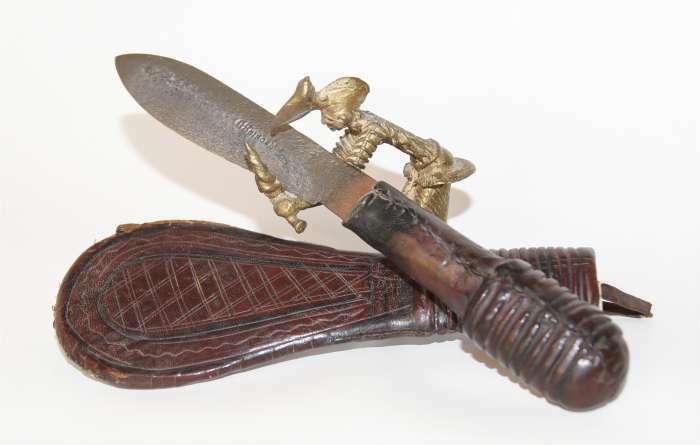 Teddy Roosevelt?s very own hunting knife. Thanks for posting that marchone. Interesting knife blade. Interesting read. Thanks for posting. I wonder what price a "priceless treasure" commands these days? I also wonder if Roosevelt's publishing of his book, "The Wilderness Hunter" a year prior inspired Gerard's gift? I believe there's been a law passed that would prevent a sitting POTUS from keeping a treasure like that for himself. Today, it would be owned by 'the people' and probably displayed in his presidential library. That's right. We couldn't have government employees monetizing their positions, could we? Oh, wait....I forgot laws only apply to certain people. Under current law, as I understand it, the President may accept gifts from Americans who are giving it out of friendship. The President may not keep gifts received from foreign interests. As a practice they likely won't accept them from anyone to avoid the criticisms. Clinton took a lot of gifts from his terms (some given to Hillary) and after all the criticism they bought some of them and perhaps returned others. I would like to know more about the Russell blade and whether it was a standard pattern they offered or a one time blade made for this gift. I removed my thread comment as it sounded kind of critical when I reread it. Well, there ya' go......ol' wolfy passin' out misinformation again. I should have researched before spewing forth that which I remembered vs. actual fact. I guess I should be happy in at least remembering there was SOME kind of law passed regarding gifts given to the president. Another. The canvas strap attached makes me guess it was made after the Kephart. No ID yet on this one. 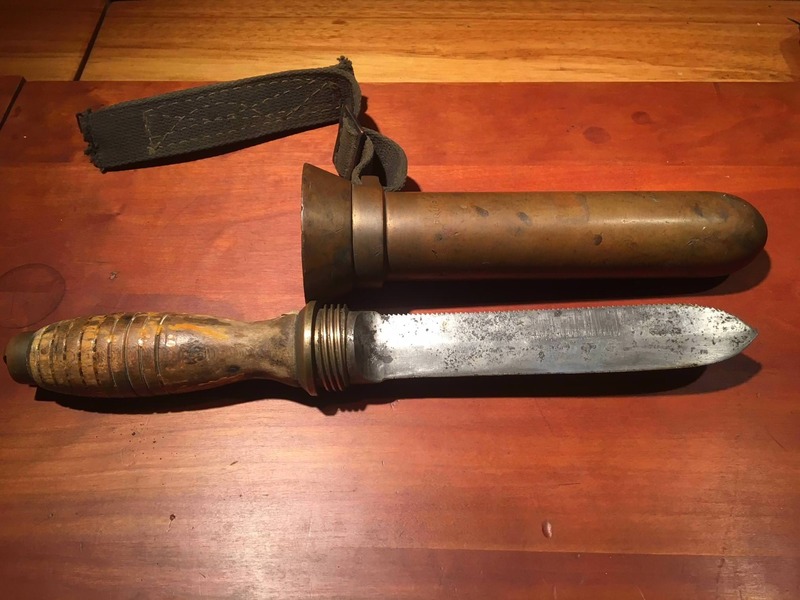 EDIT: It is likely a WWII hard hat diving knife. Many examples abound. This is a French Emouleur Thiernois knife that likely preceded the Kephart. Looks like it is disguised as a powder flask. Can I get a translation? Sorry, but I don't speak French. You could try to use Google Translate. The company was called 108 Girondias. Thiers is an area of France where a lot of knives are made. The Emoulieur might be a person who makes knives (not some person but a name for all knifemakers) If it had an R on the front so it was Remoulieur that would be a grinder. The city is Thiers. It is to France what Sheffield is to England, Solingen to Germany, Maniago to Italy and Seki is to Japan. Or least was in the past. This is a 1982 Chris Reeve Survival Knife One Piece Prototype. Blade and hollow handle shaped with material removed from a solid billet of steel. Thickest part of stock 2/3 off-center, serrated spine. 7-inch blade. He must have visited the Kephart Museum in North Carolina at some point. At that time there were quite a few all metal knives coming out. Many had hollow handles where you stored survival items like fishing line and hooks or fire starter supplies. Some had saws on the spine like this one. Reeve, being both talented and smart, chose a strong convex grind and made the blade stout. Shorter arc to the point that most of them. I had one of the early Buck models. It was big, kind of imposing, and I sold it a long time ago. Do you own it, marchone? No. Not mine. I just keep stumbling onto more examples.